In Bugzilla, Duplicates are a list of bugs, which are raised most frequently. Duplicates are the most frequently seen open bugs. Duplicates count the numbers as the Dupe Count of direct and indirect duplicates of a defect report. This information is helpful to minimize the number of duplicate defects. Duplicates help to save time for QA engineers to log a new defect always. Duplicates also help stakeholders to find out the root cause, if the same defects are reopened repeatedly rather than just a new defect. Review the most frequent bug list with the respective issue noticed. If the problem is listed as a bug in the list, then click on the bug id to view details and confirm whether it is the same issue or not. Comment on the additional observation, link it with your Test Case if required and re-open if it is closed. If the exact problem is not listed, try to find a similar defect that is already listed. If the user finds the defect that are dependent on new observations, he can comment and link the defect. If the user cannot find the defect, log a new one. To generate Duplicate reports in Bugzilla, we have to follow the steps given below. Step 1 − Click on the Report hyperlink in the header of the homepage. Step 2 − As soon as you click on Report, the Reporting and Charting Kitchen page opens. Click on Duplicates hyperlink under the Current State section. 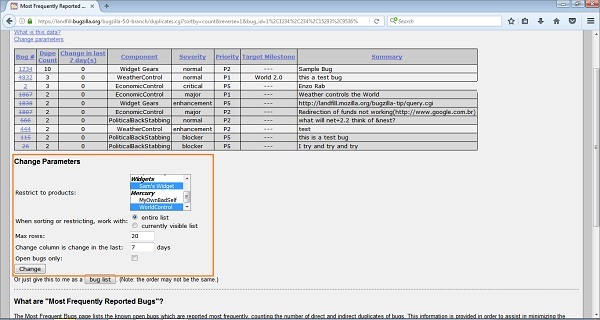 Step 3 − By clicking on Duplicates, open the Most Frequently Reported Bugs table. 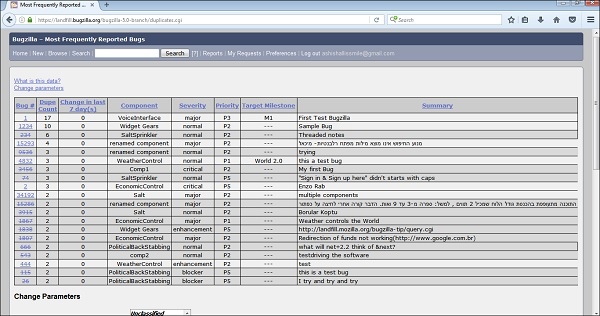 It has various columns as Bug Id, Dupe Count, Component, Severity, Priority, Target Milestone, and Summary. This is an interesting feature to filter or customize the Most Frequently Reported Bug tables. Following are some of the important pointers, which are explained in detail. Restrict to product − It filters out the table based on specific Product and components. The user can choose from single or multiple products by pressing CTRL + Click. When sorting or restricting, work with − It has two options, either the entire list or the currently visible list. Max Rows − The user can give a number to see the number of defects in one page. Change column is change in last − The number of days a user wants to review the changes that have taken place. Open Bugs only − This will filter out all the bugs those are closed. The result will have a list of only open defects. When the user Clicks on the Change button, all these filters will change and the bug list will be filtered out.